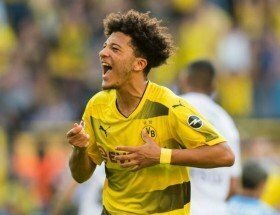 Sancho wanted at United this summer? Sancho left Manchester City for Dortmund in the summer of 2017 and he has since transformed into a regular while keeping Christian Pulisic on the bench. His exploits have also resulted in him earning his debut with England and Metro reports that United could now seek to lure him back to the Premier League next term. United currently have the services of Marcus Rashford and Anthony Martial who have impressed with their wingplay but the club are likely to add further reinforcements with Juan Mata among those possibly heading through the exit door. Still, the Mancunian outfit are unlikely to get the youngster on the cheap with the Bundesliga leaders said to want a significant sum of around £90m to consider the sale of the 18-year-old. United make the trip to the King Power Stadium this weekend for the league clash against Leicester City. The club are currently two points behind the top-four positions.